The above copper half penny measures 21.0 mm and weighs 2.59 grams. It was issued by Thomas Clatworthy at the sign of the Crooked Billet (i.e. a crooked stick) in White Hart Yard in 1666. Obverse: (rosette) THOMAS.CLATWORTHY.AT.THE , around twisted wire, within the depiction of a crooked billet. 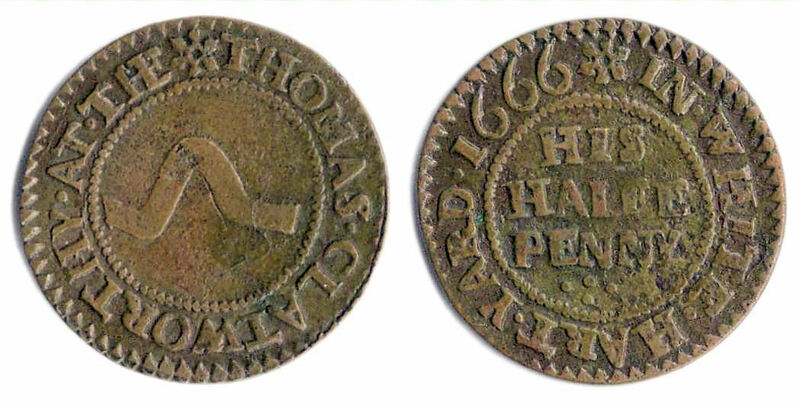 Reverse: (rosette) IN.WHITE.HART.YARD.1666 , around twisted wire inner circle HIS / HALFE / PENNY in three lines, below four dots arranged in a cross pattern. There are still public houses and restaurants in south-east England that trade under the name of the “Crooked Billet”. A crooked billet was a bent wooden stick or cudgel which was used to play a game which was possibly a for runners of modern-day cricket. Searches of the 1662, 1664 and 1666 Hearth Tax returns for London and Westminster (made by myself) have returned no entries for anyone with the name Clatworthy or Clayworthy etc.